These plans agree with basic FHA/VA regulations, and meet (CABO) one and two family dwelling code. Check with your builder regarding local codes that may vary. Minor alterations can be made by your local builder without drawing new plans. The owner and contractor assume the responsibility to meet all local codes. FOUNDATION PLAN-On many of our plans we offer you options on the type of foundation you prefer. The available options for each plan are shown on the page with the plans. FLOOR PLAN-Included with your plans will be a detailed floor plan, 1/4 inch scale, including location of lights, receptacles, switches and plumbing fixtures. Window and door sizes are noted. 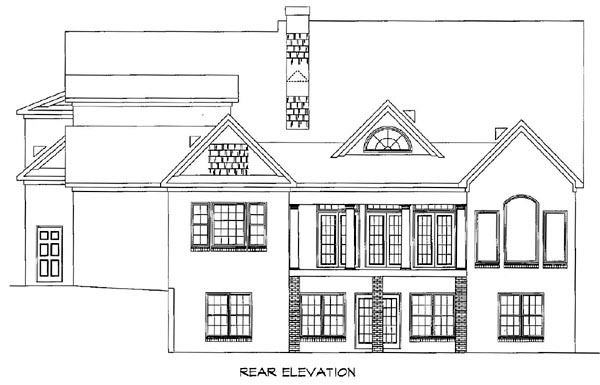 ELEVATIONS-Our plans include complete front elevations drawns at 1/4" scale, other elevations drawn at 1/8" scale. DETAILS-We furnish any necessary sections for construction of the home like Wall Sections, Stair Sections, Foundation Sections, etc. Designer does not allow modifications be made to PDF. Please order CAD file for modifications.